Excavating – Ace Bobcat Ltd. 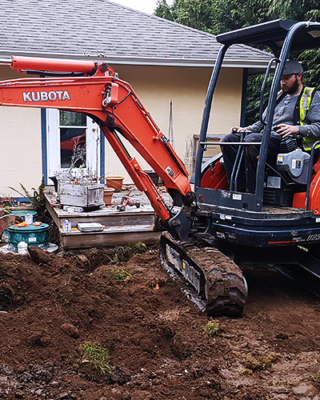 Since 1999, Ace Bobcat & Septic Services has been the company to call for excavator services in the Cowichan Valley and throughout the southern portions of Vancouver Island. We have four different sized excavators that can literally tackle any size job. From small back yard work to turning a mountain into a mole hill, if you have a project, we have an excavator to suit. We also have a “Mega Track Cat”. This is a bobcat machine on steroids! This incredible machine can level ground and disintegrate loads of fill and place them exactly where needed. We have a compactor with our Track Cat to firm up the road base for your driveway. We also have a track dump, small compactor, and various other hand tools we need to do the job right. Even though we don’t use it as much any more we even have a regular Bobcat here at Ace Bobcat! Safety is a priority for us here at Ace Bobcat, there are many potential hazards when working with large equipment on sites. Safety starts in our shop where we properly maintain our equipment. First and foremost, we always seek to protect the safety of your loved ones, our crew, and your property. We are in excellent standing with Work Safe BC and we carry proper liability insurance. To schedule an excavation or free consultation, call Ace Bobcat & Septic Services! We have experienced operators and the right equipment to get the job done. Unlike other construction and municipal works companies, we do not have a high rate of turnover. We are a cohesive unit. This means our team has excellent communication and will be there to follow up with you after the work has been completed.